Mahatma Gandhi, a religious as well as political leader in India, was not a Christian, but there are lessons his life can teach those of us who are Christian leaders, those of us who are pastors. One such lesson is from Gandhi’s use of the spinning wheel. 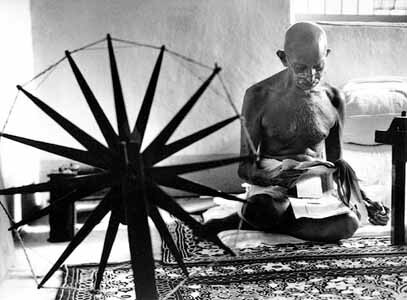 Gandhi’s spinning wheel was a tangible way for him to communicate to the people of India the importance of freeing themselves from economic dependence on the British. If they would spin their own cotton they could make their own clothes and not depend on purchasing clothing from Britain. I don’t have a spinning wheel, but I do have other ways of spending my time that replenish my soul. Yes, of course, there’s the time I spend in my daily devotions of Bible reading, other spiritual reading, and prayer. This is top on my list. But I have other less “spiritual” activities and hobbies that help me keep my balance as I face the rigors of ministry. Photography is a serious hobby for me. When I am about the business of lining up a good photograph the time seems to either stand still or fly by, I’m not sure which. Writing is a big part of my time away from pastoral ministry. I’ve written both non-fiction and fiction, including a couple of novels. I also raise a small flock of chickens as a hobby, and have done so for over a quarter of a century. Then too I have a decorative pond with waterfall, fish, and floating pond plants that I maintain. These are my “spinning wheels” that help keep me sane in ministry. Such interests keep me from putting all my emotional eggs in the basket of pastoral ministry (sorry, after all these years of raising chickens I can’t resist a poultry analogy). The apostle Paul was a tent maker. This was probably out of economic necessity more than anything else, but I can’t help but wonder if he didn’t also appreciate the break from his usual apostolic duties. I’m sure Paul did a lot of talking, listening, praying, and even mentoring while working on tents, but there must still have been something therapeutic about using his hands. If I could give some advice to those going into ministry I would strongly suggest that they hold on to or adopt some other interest or outlet other than pastoral ministry to which they could give their time and attention on a regular basis, a “spinning wheel” to which they could go regularly for a change of pace. My “spinning wheels” have be instrumental in my longevity as a pastor and as a pastor in one place. They have been used of the Lord in my life to keep me at the task of serving His people as their pastor. How about you? What are the “spinning wheels” in your life? Please, share with the rest of us.